One sure fire way to get my kids to taste their vegetables?? 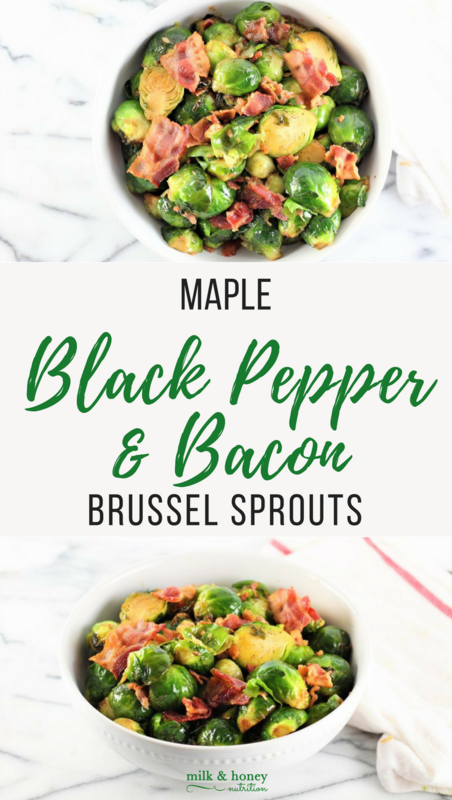 Throw some bacon on 'em :-) These Maple Black Pepper and Bacon Brussel Sprouts will please the whole family! Preheat a large cast iron skillet or dutch oven on the stove over medium heat. Add the bacon to the pan and cook until crispy. While the bacon is cooking, chop the brussel sprouts in half lengthwise. Add the avocado oil to the pan along with the brussel sprouts and minced garlic. Let them saute and cook for 10-15 minutes (stiring occasionally) or until the brussel sprouts get a good brown on them. Add the black pepper, bacon, and maple syrup to the pan and toss to combine. Serve immediately and enjoy!